So I might have been a little whiney about being in the yard the last several weeks. But much of really has to do with the fact that it had originally been planned as a quick two-week haul. The unexpected cost and total derailment of my timeline is really what had me-not the being on the hard so much. In fact, some things we really enjoyed. Because we keep our boat docked behind a condo, we don’t have that “marina” environment. Our neighbors are pretty much just weekend sailors, which is great, but the variety of sailors we met while at the yard was refreshing. We found we had missed that quirky environment. Just watching the boats from all over the world pass through, the stinky stench of the commercial fishing pier, and sounds of welding, grinding, pounding was a little like taking a trip home. While in the boat yard we met other sailors and cruisers and about-to-be-cruisers in all stages of their adventures. There was an older couple who had built their own ferro boat and sailed it from England, through the Caribbean, and were headed up to the Carolina’s to see a bridesmaid whom they have not seen since their actual wedding day (50 years ago! ), before they sail back home. How sweet. Safe voyage Glennis and Ken! There was a family just back from their first cruise in the Bahamas and a couple polishing up their boat for the market as their cruising time is over. There was a cruiser who was preparing to down-size boats to keep cruising comfortably single-handed. Lots of interesting people. We also met a great young couple, Kelley and Jason, who are just about to cruise towards a new life in Colombia with their two dogs. 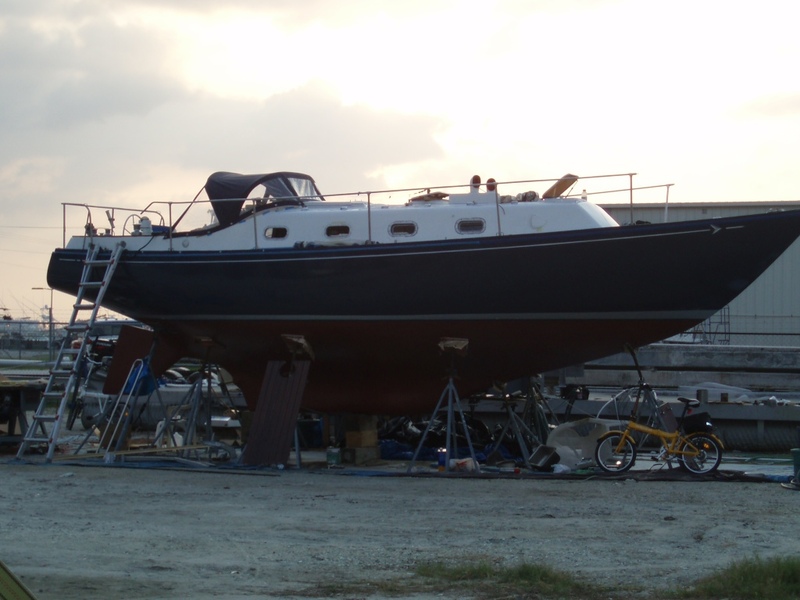 Their adventure began several months ago when they quit their jobs and started a complete refit on their 34 foot Seafarer. We enjoyed sharing stories and plans, doing some troubleshooting together, and admiring each others completed projects. Kelley just finished thoughtfully redesigning her entire galley and it looks great! That girl can knock out some projects. They will be leaving before us and have given us quite a bit of inspiration; they renewed a bit of the anticipation and excitement of what we are working towards. Kelley and Jason, hope to meet up with you again-we will be following your adventures on your blog. Safe sailing. Somehow I missed getting a photo, but here is that pretty boat,Chance. ← Haul Out-Day 55-All is well again. PS… I hid a bait fish in that surveyor’s truck the other day. No abuse of free time-it was fun and you guys gave us lots of great info- Can’t wait to put together our wifi antennae. Seriously though, hope we get a chance to bump into you guys again before you set off for far far away (is)lands. We have a dock calling your name down here and a cockpit ready for some entertaining.